Jalyn Courtenay Webb singing “A Natural Woman.” Photo by Tom Jones. Referee and Emcee for the event is Jalyn Courtenay Webb. She stirs up support for both teams, while the audience provides the scoring! It is obvious early-on, that this is an unusual show. At the pre-performance announcements, the audience is normally reminded to turn off all cellphones, that taking of photos is strictly prohibited, etc. Not here. Webb announced that cellphones are to be left on to help with the scoring process, and that photographs are encouraged, but without flash. The Motone four arrive with white training robes, while the Jerseys are in bright red. 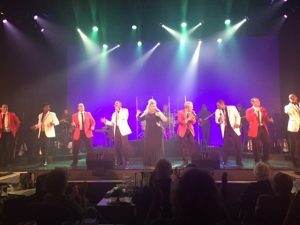 They spar from opposite sides of the stage, while an enormously effective orchestra remains on stage to keep the music rolling. 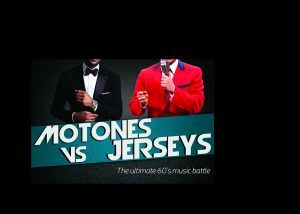 The show, referred to as “The Ultimate Music Battle of the 60’s,” was conceived and created by Narrative Creative and Starkey Productions, with this version directed by Kenneth Moten, Jr. There is virtually something for everyone – including “Under the Boardwalk,” “Walk Like a Man,” “Yesterdays,” and “Stand by Me.” Music represents such recording artists as Marvin Gaye, Smokey Robinson, Frankie Valli, The Four Seasons, the Temptations, The Four Tops, Stevie Wonder, Bruno Mars, Gladys Knight and the Pips, the Beach Boys, Rick James, The Platter, The Flamingos, Herman’s Hermits – and more! Choreography is by Jessica Hinsley. 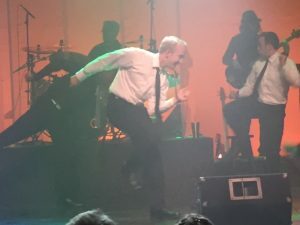 The on-stage instrumental music is performed by Paul Falk, Larry Bridges, Ryan Millard, Michael Rinko, Tanner Robison, and either Dave Lunn or Kate Vincent on saxophone. Only downside for me is the limited printed program. 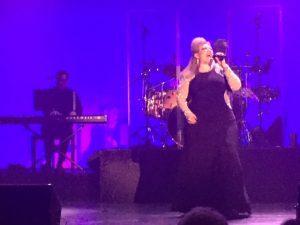 I am usually able to follow a show’s progress, showing what musicals numbers are included. This is a new generation, however, where Smartphone owners have complete knowledge of the show’s progress. But why worry, the non-stop music is a delight for every generation – with or without a Smartphone!